Over the past few days the OH and I have attended some events commemorating the 150th Anniversary of Oaks Colliery Disaster. Here are a few photos and thoughts. DVLP means Dearne Valley Landscape Partnership which is far too long a name to keep writing out! The event on Sunday 11 December at the Barnsley Main site had been advertised in the Barnsley Chronicle the previous week. The idea was to place wooden crosses, similar to those used on Remembrance Sunday, near the site of the Oaks Colliery. The OH drove us down from Cudworth. Years ago, when I could still walk long distances, we had walked around Hoyle Mill photographing various interesting sites and probable locations for his family history such as Ash Row and the filled in canal and the Barnsley Main site, and I knew that it was too far for me to walk up there from the nearest bus stop now. We arrived fairly early so we were able to park (with my blue badge displayed) opposite the site. Hot drinks and mince pies were available and the OH happily accepted a cup of coffee. The wooden crosses were arranged alphabetically in half a dozen large boxes and a helpful clergyman (Rev Dewey according to the programme of the event we were given) and several young girls found the three I had emailed to reserve. Matthew Scales, John Everett and Henry Wilby, as I explained in my post last week, are related to the OH via his 4x great grandmother Sophia Bedford. People were gathering and the above photo was taken by Peter Davies whom I know via the Barnsley War Memorials Project (BWMP). He takes wonderful photos of church memorials and stained glass windows and is connected to the Thurnscoe History Group as well as the People and Mining Group who are fundraising for the new Oaks Memorial sculpture which is being created by Graham Ibbeson. One of our crosses was claimed back by some family members who were more closely related to Henry Wilby than the OH. They were just about to share their family tree with us when the speeches started! After some introductory words from the Chair of the Barnsley Main Heritage Group (who seem to be so new they haven't got a website or a Facebook page to link to), Councillor Brian Mathers (who has a close interest in the history of the Oaks Colliery) and our local MPs, Dan Jarvis and Michael Dugher, the cross placing began. I was glad I'd worn my older boots as the grass was very wet and lumpy. I've seen photos of the site during its recent tidy up by the Friends of Barnsley Main - it had been quite overgrown and lots of litter was picked. After the OH and I planted our crosses I sought out the Wilby descendants whom we had met earlier. They had a large family tree showing Henry Wilby's parents and children and an Oaks Bible. We explained that the OH was descended from Henry Wilby's wife by her first husband, had a good discussion and exchanged email addresses, as you do. They allowed us to take some photos of the bible for this blog. These bibles were given to all the recipients of funds from the Oaks Colliery Explosion Subscription Relief Fund. This one was inscribed to Willie Wilby, whom I knew from my own research was the OH's second cousin 5x removed, eldest son of Henry Wilby and Jane Bedford. Bill Shaw from the People and Mining group came up to speak to us and he told us he had a bible inscribed to Tom Wilby, Henry's youngest son, which he had been given by the sole surviving descendant of that line still living in this country. Fantastic coincidence! It was a real privilege to see and touch an actual item our ancestors would have held. My Downton Abbey hat on TV! I was asked by Stephen Miller, who had organised the DVLP's research project into the names of the men killed, if I wouldn't mind speaking to the man from the Calendar news programme who was there. The OH and I were both interviewed by the reporter, and a section of my piece was shown that evening on the news. My friend Fay managed to catch my moment of fame and you can see the full report here on YouTube. There was also coverage on the BBC Look North programme. 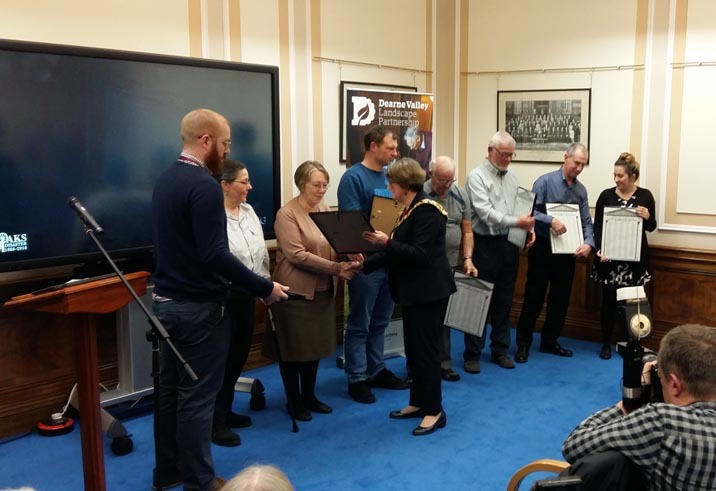 On Monday evening the OH and I attended the official launch of the Oaks Colliery Disaster Exhibition which is at Experience Barnsley Museum until 8 February 2017. I had been invited because I had done some research for the DVLP on some of the names of the men killed in the explosion on 12 December 1866. I had researched about a dozen names, but I know some of the other volunteers researched hundreds - great job and well done to everyone. I was sorry not to have done more but pressure from BWMP work prevented me. The event was held upstairs in the reception rooms at the front of the Town Hall. I've been in there before, in fact one of the sections is the room where the OH and I were married twelve years ago. The room was already busy by the time we arrived (we'd had tea at the Joseph Bramah on the way so I could rest instead of having to cook and wash up) and again tea and coffee were on offer. There were the usual introductions and then an overview of the project by Stephen Miller (who has done a wonderful job). He named all the volunteers who had helped, which included myself, and explained that he'd not realised how big an undertaking the Oaks Colliery Disaster work would be. 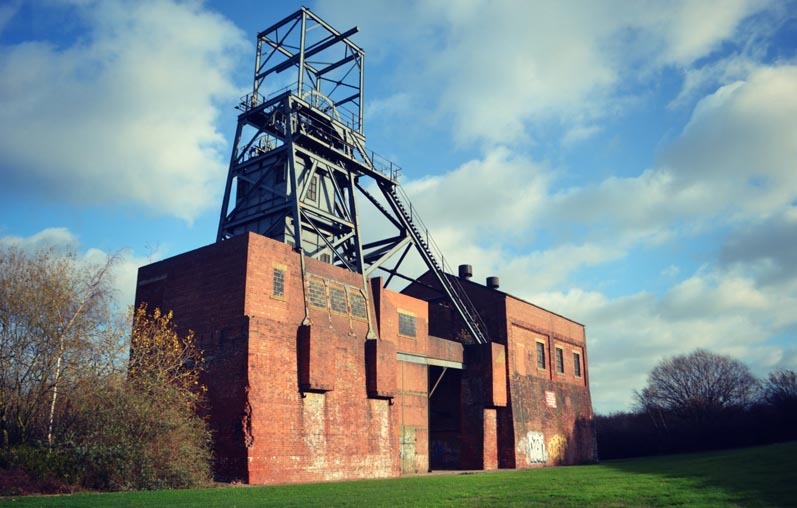 There were some poetry readings by Ian McMillan and three people who had attended a workshop to create works inspired by the Oaks Colliery Disaster. The OH commented that the man who spoke was a Barnsley CAMRA member. I sometimes think the OH knows everyone in Barnsley either via CAMRA or his work! At the end of the Mayor's speech Stephen called all the volunteers present up to the front of the room. Now that was a surprise. The Mayor, Councillor Linda Burgess, then shook our hands and handed us each a framed commemorative list of the 383 names of the men killed in the disaster. That's me in the photo above, on the left of the row, next to receive a plaque, just hiding behind Stephen. Afterwards we all went down to the exhibition which is in the display area next door to Barnsley Archives. There are photos of surviving miners, rescuers and widows with their stories, and some artefacts including a rather scary preserved pony's hoof! The visual recreation of the Oaks Colliery runs on a screen on the wall continually and includes a list of the names of the men killed. It was lovely to be thanked for my contribution to the project. I'd like to thank Stephen Miller and the rest of the DVLP team for giving us the chance to do the work. When NS, one of the other volunteers, mentioned that he had a void in his life now the project was complete Stephen promised that we could go on to research other mining disasters and accidents in the DVLP area. That might take us the rest of the lifespan of the DVLP to complete! Thank for the excellent review. You are right the Barnsley Main Heritage Group is very new but we hope to be on facebook soon.